It looks like Temple has finally gained footing on its in-state counterparts. I'm not going to imply that Temple's fortunes will be greater than that of Pittsburgh's or even that of Penn State's - they lost to both teams this past year. Temple's Templar yearbook presents a look at student and athletic life at Temple University. The Templar is available from 1923-2009 and is a nice look at Tample's gridiron history. I find it interesting that Temple's most memorable seasons are clearly their most forgotten years and the Owl's forgettable gridiron struggles are how most remember Temple football. 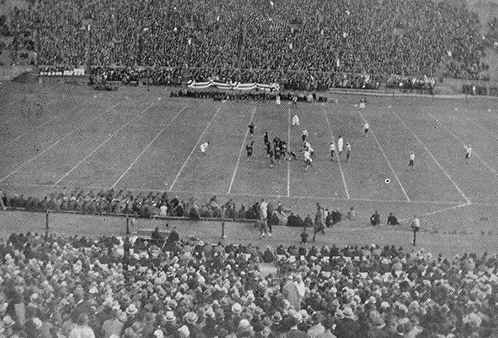 Remember that Temple actually played in the inaugural Sugar Bowl way back in 1935 - a 20-14 loss to Tulane. Today that match up would be a bottom of the stack, mid-October, Big East game of the week. What made great Temple back then?.. None other than the enterprising, unforgetable, Pop Warner. 1934 was Warner's second year in charge of Temple after successful coaching runs at Cornell, Carlisle, Pitt and Stanford. By 1938 Warner's career had run its course (319-106–32) and Pop retired an Owl going 31-18-9 as Temple coach. Enjoy the Temple yearbooks; the newest addition to my yearbooks list. Rich Ellerson hired a couple of coaches to fill vacant spots on the coaching staff. The two coaches hired to fill the big shoes of McKeehan and Tripp are Todd Spencer and Tom Simi. I like Ellerson's choices. Spencer has extensive experience coaching mostly option offensive lines his entire career. Like McKeehan, who coached at Navy, Spencer coached eleven years at Navy before following Paul Johnson to Georgia Tech. Sounds like a nice get for an O-line coach. Todd Spencer seems like he fits the scheme. The other new offensive line coach is Tom Simi who has been the head coach of the United States Military Academy Prep team since 2009. Simi is a graduate of Eastern Oregon University. He was an assistant coach from 1997 through 2001 at his Alma mater. Most of that time he served as an assistant under former head coach, current Black Knights offensive coordinator, Ian Shields. Simi has a thorough understanding of the Army offensive system and terminology. The first thing I thought when I read that was that it seems like they are surrounding Ian Shields with his guys - for quick internal succession in the event of another disastrous season. I still feel like that may be the case and I am relieved at that since I see Shields and his offensive mind as the one indispensable element of this coaching staff. Don't get me wrong - I like Rich Ellerson as head coach; I just like R.E. a whole lot more with Shields running the offense than bringing anyone else in at the top spot and losing the Off. Coordinator to the regime change. No matter how you slice it the more the staff thinks like Ian Shields the more I like it.